This article is about the 2018 Ranch and River fires. For information about the 2007 Ranch Fire, see October 2007 California wildfires. The Mendocino Complex Fire was the largest recorded fire complex in California history. It was a large complex of two wildfires, the River Fire and Ranch Fire, which burned in Mendocino, Lake, Colusa, and Glenn Counties in the U.S. State of California, with the Ranch Fire being California's single-largest recorded wildfire. The Ranch Fire burned eight miles northeast of Ukiah, and the River Fire burned six miles north of Hopland, to the south of the larger Ranch Fire. First reported on July 27, 2018, both fires burned a combined total of 459,123 acres (1,858 km2), before they were collectively 100% contained on September 18; the Ranch Fire alone burned 410,203 acres (1,660 km2), surpassing the Thomas Fire to become the single-largest modern California wildfire. The Ranch Fire also surpassed the size of the 315,577-acre Rush Fire, which burned across California and Nevada, as well as the Santiago Canyon Fire of 1889, which was previously believed to have been California's all-time largest wildfire. The fires collectively destroyed 280 structures while damaging 37 others; causing at least $267 million (2018 USD) in damages, including $56 million in insured property damage and $201 million (2018 USD) in fire suppression costs. The city of Lakeport, communities of Kelseyville, Lucerne, Upper Lake, Nice, Saratoga Springs, Witter Springs, Potter Valley, and Finley, parts of Hopland, and the tribal communities of Hopland Rancheria and Big Valley Rancheria were evacuated. The smaller River Fire was the first fire in the complex to be contained, reaching full containment on August 13, while the Ranch Fire continued to burn for more than a month after that, with flames on the northern flank of the Ranch Fire pushing eastward from the Snow Mountain Wilderness into Glenn County. The Ranch Fire finally reached full containment during the evening of September 18. However, the Ranch Fire continued to burn deep within containment lines. The Mendocino Complex comprises two vegetation fires that burned within miles of each other near Clear Lake, in Northern California. The first of the two fires reported was the Ranch Fire, which was reported on July 27, 2018 at 12:05 PM PDT, off Highway 20 near Potter Valley. Within hours of being reported, the fire had injured two firefighters. Approximately one hour later, the River Fire was reported on Old River Road, six miles north of Hopland, located south of the Ranch Fire. By the evening, the River Fire had burned 4,000 acres (16 km2) and destroyed two buildings, including a home. The fire threatened the University of California, Berkeley Hopland Research and Extension Center. High heat, low humidity, and rugged terrain challenged control of the fires, with gusty winds causing both to grow. Overnight, five more firefighters were reported injured. By the next morning, the two fires were organized under the "Mendocino Complex" name. The River Fire had grown to 3,500 acres (14 km2), the Ranch Fire had burned 6,000 acres (24 km2), and both were at two percent containment, with 386 structures being threatened. With Red Flag Warnings in effect, the first mandatory evacuations began in Hopland and with residents along Highway 175. Mendocino College was named an evacuation center. By the afternoon, the community of Lakeport and additional areas of Lake County were placed under mandatory evacuation and, later that evening, Potter Valley and parts of Upper Lake were evacuated. By the morning of July 29, three more structures had been destroyed, all houses. Dry and windy conditions persisted, and the lack of available firefighters due to other fires burning in the state slowed attempts at containment. The communities of Witter Springs, Finley, Saratoga Springs, Nice, Bachelor Valley, Scotts Valley, and Big Valley Rancheria were evacuated. The fires rapidly grew overnight, with the Ranch Fire totaling 35,076 acres (142 km2) and the River Fire reaching 20,911 acres (85 km2) by the morning of July 30, with the fires at 10 percent containment. Later in the afternoon of July 30, evacuation orders were lifted for Hopland, the Hopland Rancheria, and the area just north of Largo, while evacuation orders were put in place for Kelseyville and Finley. Containment of the fire declined to five percent as the fires grew in size. One more home was destroyed and one damaged. Evacuation orders were lifted for Potter Valley in the afternoon of July 31. By the evening of July 31, the fires had burned a combined total of 80,408 acres (325 km2) and were 12% contained. The two fires continued to burn into August, with the Ranch Fire at 59,014 acres (239 km2) and the River Fire at 31,898 acres (129 km2) on August 1. The Ranch Fire remained at 15 percent containment, while the River Fire was at 38 percent containment. Containment line improvement remained the focus of fire crews, with some crews directly fighting the fire when conditions permitted. Additional crew support arrived from the US Forest Service. Throughout the day, both fires grew, with the Ranch Fire burning into the Mendocino National Forest and south of Lake Pillsbury. Overnight, the fires remained most active in higher elevations. By the morning of August 2, the two fires had burned a combined total of 110,168 acres (446 km2) and were 39 percent contained. Mandatory evacuations were put in place in Western Lake County, particularly for areas west of Lucerne and north of Clear Lake. On the evening of August 4, the combined acreage was 229,000 acres. By the morning of August 5, the combined acreage was 271,172 acres (1,097 km2), with 152 buildings destroyed. On the morning of August 6, the combined acreage was 273,664 acres (1,107 km2), with 169 buildings damaged or destroyed. By the night of August 6, the combined acreage of the Mendocino Complex Fire was 283,800 acres (1,148 km2), surpassing the Thomas Fire, and becoming the largest wildfire complex in modern California history. Satellite image of the Ranch Fire on August 15, 2018. On August 7, 2018, officials announced that they predicted the Mendocino Complex would last through August and into early September, compared to the earlier prediction of mid-August. By then, the fire complex had destroyed 143 structures, 75 of them residences. By late August 7, the fire complex was 34% contained. Of the two fires, the Ranch and River Fires, the River Fire was 78% contained, while Ranch Fire was only 20% contained, with flames on the northern flank still pushing towards Snow Mountain Wilderness. By the night of August 7, the combined acreage was 283,800 acres (1,148 km2), with 169 buildings damaged or destroyed. By the morning of August 8, the fire had destroyed 221 buildings, while damaging another 27. By Wednesday morning, on August 8, 2018, the Mendocino Complex Fire had burned 300,086 acres (1,214 km2) and was 47% contained. Cal Fire estimated that containing the entire fire complex could take until September 1, over a month after it ignited on July 27. By Thursday, August 9, 2018, the total area burned had grown to 302,086 acres. By Saturday morning, on August 11, 2018, the Mendocino Complex Fire had burned 325,226 acres (1,316 km2), was 67% contained, and had destroyed 258 buildings. On the morning of Sunday, August 12, the Ranch Fire grew to 282,479 acres (1,143.15 km2) and was only 62% contained, surpassing the Thomas Fire as California's single-largest modern wildfire. Meanwhile, the River Fire remained at 48,920 acres (198.0 km2), with 93% containment, with the Mendocino Complex Fire having burned a total of 331,399 acres (1,341.12 km2). During the evening of Monday, August 13, the River Fire was fully contained at 48,920 acres (198.0 km2), leaving the Ranch Fire as the only active fire within the Mendocino Complex. However, the larger Ranch Fire continued to expand. By the evening of August 14, the Ranch Fire had grown to 305,990 acres (1,238.3 km2), with only 64% containment, increasing the size of the Mendocino Complex Fire to 354,910 acres (1,436.3 km2), with a collective containment of 64%. Around that time, it was reported that the Ranch Fire had killed a firefighter from Utah. On August 16, the Ranch Fire grew to 317,117 acres (1,283.33 km2), increasing the total burn area of the Mendocino Complex Fire to 366,037 acres (1,481.30 km2); this allowed the Ranch Fire to surpass the size of the massive Rush Fire in 2012, which burned across California into Nevada, as well as the Santiago Canyon Fire of 1889, which was believed to have been California's all-time largest wildfire, estimated at about 300,000 acres (1,200 km2). By the morning of August 18, the Ranch Fire had reached 331,770 acres (1,342.6 km2), with 76% containment, increasing the size of the Mendocino Complex Fire to 380,690 acres (1,540.6 km2). August 19 was a day of chaos wherein LAFD firefighters were surrounded and had to scramble through the forest to safety. A firefighter was flown to a burn center and another four were treated for burns. Another firefighter was treated for a dislocated shoulder. On August 28, the Ranch Fire reached 410,182 acres (1,659.95 km2) and was at 93% containment, increasing the Mendocino Complex Fire's burn area to 459,102 acres (1,857.92 km2). On the same day, it was reported that the Ranch Fire had stopped its forward spread. 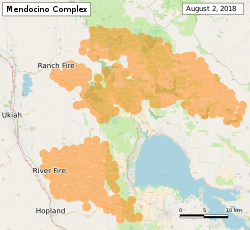 On September 1, InciWeb updated the Ranch Fire's size to 410,203 acres (1,660.03 km2), with 96% containment, as the fire burned through previously unburned areas in interior regions, increasing the burn area of the Mendocino Complex Fire to 459,123 acres (1,858.00 km2). Afterward, the Ranch Fire stopped growing, with containment of the Ranch Fire increasing to 98% by September 4. During the next couple of weeks, containment of the Ranch Fire remained at 98%, without any further growth in size, as the fire continued burning deep within the fire perimeter, within the northern portion of the burn area. On September 19, the U.S. Forest Service reported that the Ranch Fire had been fully contained during the evening of September 18, bringing both of the fires in the Mendocino Complex to full containment. However, InciWeb stated that the Ranch Fire was not out yet, as hotspots continued to smolder deep within the containment lines of the fire. The River and Ranch Fires impacted communities along the Mendocino and Lake County borders, causing the evacuations of Lakeport, Kelseyville, Lucerne, Upper Lake, Nice, Saratoga Springs, Witter Springs, Potter Valley, Finley, parts of Hopland, and the tribal communities of Hopland Rancheria and Big Valley Rancheria. The community of Upper Lake was evacuated during the Mendocino Complex fires. Highway CA-20 area from one mile south of Highway CA-20, east of Potter Valley Road, south of the fire perimeter, and west of Mendocino-Lake County Line. Western Lake County, area is west of Lucerne at Bartlett Springs Road and Highway CA-20, south of the fire, east of the fire, north of Clear Lake including the communities of Blue Lakes, Upper Lake, Nice, Lakeport, Witter Springs, Bachelor Valley, Scotts Valley, Saratoga Springs. Portions of Highway CA-20 were closed from July 29 to August 8. On August 8, at 11:00 AM PDT, Highway CA-20 was open from Highway US-101 to Highway I-5. The NorCal Livestock Evacuation and Support organization, worked with farmers to help evacuate farm animals and domestic pets. The American Society for the Prevention of Cruelty to Animals (ASPCA) and Lake County Animal Care and Control, also worked on evacuating and caring for animals displaced by the wildfires, while checking residences for pets or livestock. 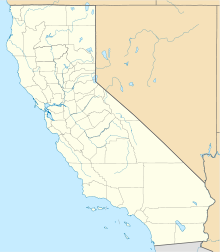 ^ a b c d e f g h "Mendocino Complex Information - InciWeb the Incident Information System". September 22, 2018. Retrieved September 22, 2018. ^ "River Fire (Mendocino Complex)". CAL FIRE. State of California. Retrieved 29 July 2018. ^ a b "Ranch Fire (Mendocino Complex)". CAL FIRE. State of California. 20 September 2018. Retrieved 22 September 2018. ^ a b "2018 National Large Incident Year-to-Date Report" (PDF). National Interagency Fire Center. September 19, 2018. Retrieved September 20, 2018. ^ a b c Martin Espinoza; Nashelly Chavez; Randi Rossman (15 August 2018). "Firefighter who died battling Mendocino Complex fires mourned by Utah town". Retrieved 16 August 2018. ^ a b c "Mendocino Complex Information – September 15, 2018" (PDF). United States Department of Agriculture. September 15, 2018. Retrieved September 20, 2018. ^ n/a, n/a (2018-08-09). "California wildfires: Eight images that reveal scale of devastation". BBC. Retrieved 2018-08-09. ^ a b "Rush Fire". Inciweb. Archived from the original on 2016-03-04. Retrieved 2013-09-01. ^ a b Chris Wilson; David Johnson; Jennifer Calfas (16 August 2018). "California's Massive Wildfires Are Nearly 10 Times the Size of San Francisco". Time. Retrieved 18 August 2018. ^ a b Chane Croucher (7 August 2018). "400, Firefighters Battle Mendocino Complex Fire, The Largest Blaze In California History". Newsweek. Retrieved 18 August 2018. ^ a b Andy Crauss (14 August 2018). "River Fire 100% contained, but over 12,500 firefighters still battling California fires". KRCR News Channel. Retrieved 18 August 2018. ^ a b Tchekmedyian, Alejandra Reyes-Velarde, Alene. "The Mendocino Complex is California's biggest fire ever, but residents know it could have been much worse". latimes.com. Retrieved 11 August 2018. ^ a b c Michael McGough (September 19, 2018). "Mendocino Complex, biggest wildfire in California history, now 100 percent contained". The Sacramento Bee. Retrieved September 20, 2018. ^ "Ranch Fire Incident Update – 7/27/2018 Time: 3:00 p.m." (PDF). CAL FIRE. State of California. Retrieved 1 August 2018. ^ a b "Ranch Fire Incident Update – 7/27/2018 Time: 7:00 p.m." (PDF). CAL FIRE. State of California. Retrieved 1 August 2018. ^ a b c "River Fire Incident Update – 7/27/2018 Time: 7:00 p.m." (PDF). CAL FIRE. State of California. Retrieved 29 July 2018. ^ "Mendocino Complex Incident Update – 7/28/2018 Time: 7:00 a.m." (PDF). CAL FIRE. State of California. Retrieved 1 August 2018. ^ "Mendocino Complex Incident Update – 7/28/2018 Time: 1:30 p.m." (PDF). CAL FIRE. State of California. Retrieved 1 August 2018. ^ a b "Mendocino Complex Incident Update – 7/28/2018 Time: 9:30 p.m." (PDF). CAL FIRE. State of California. Retrieved 1 August 2018. ^ "Mendocino Complex Incident Update – 7/29/2018 Time: 8:00 a.m." (PDF). CAL FIRE. State of California. Retrieved 1 August 2018. ^ "Mandatory Evacuation for the Mendocino Complex" (PDF). CAL FIRE. State of California. Retrieved 1 August 2018. ^ "Evacuation Advisory for the Mendocino Complex" (PDF). CAL FIRE. State of California. Retrieved 1 August 2018. ^ a b "Mendocino Complex Incident Update – 7/29/2018 Time: 7:00 p.m." (PDF). CAL FIRE. State of California. 29 July 2018. Retrieved 22 September 2018. ^ "Mendocino Complex Incident Update – 7/30/2018 Time: 7:00 a.m." (PDF). CAL FIRE. State of California. 30 July 2018. Retrieved 22 September 2018. ^ "Mendocino Complex Fire Repopulation" (PDF). CAL FIRE. State of California. Retrieved 1 August 2018. ^ "Mendocino Complex Mandatory Evacuation" (PDF). CAL FIRE. State of California. Retrieved 1 August 2018. ^ a b "Mendocino Complex Incident Update – 7/30/2018 Time: 7:00 p.m." (PDF). CAL FIRE. State of California. Retrieved 1 August 2018. ^ "Mendocino Complex Repopulation" (PDF). CAL FIRE. State of California. Retrieved 1 August 2018. ^ a b "Mendocino Complex Incident Update – 7/31/2018 Time: 7:00 p.m." (PDF). CAL FIRE. State of California. Retrieved 1 August 2018. ^ "Mendocino Complex Incident Update – 8/1/2018 Time: 7:00 a.m." (PDF). CAL FIRE. State of California. Retrieved 1 August 2018. ^ a b "Mendocino Complex Incident Update – 8/1/2018 Time: 7:00 p.m." (PDF). CAL FIRE. State of California. Retrieved 2 August 2018. ^ "Mendocino Complex Incident Update – 8/2/2018 Time: 7:00 a.m." (PDF). CAL FIRE. State of California. Retrieved 2 August 2018. ^ a b "Mandatory Evacuation For the Mendocino Complex" (PDF). CAL FIRE. State of California. Retrieved 2 August 2018. ^ "Mendocino Complex Incident Update – 8/5/2018 Time: 7:00 a.m." (PDF). CAL FIRE. State of California. Retrieved 5 August 2018. ^ Serna, Joseph; Queally, James; Tchekmedyian, Alene (August 6, 2018). "Mendocino Complex fire now largest in California history, capping a destructive year". Los Angeles Times. Retrieved August 6, 2018. ^ Editorial, Reuters. "California battles its biggest ever wildfire, Trump vows support". Retrieved 11 August 2018. ^ "Mendocino Fire Reaches Record Size in California". Retrieved 11 August 2018. ^ CNN, Madison Park,. "Record-breaking California fire may take until September to contain". Retrieved 11 August 2018. ^ Trisha Thadani; Sarah Ravani (12 August 2018). "Ranch Fire now largest in California history at 282,479 acres". SFGate. Retrieved 18 August 2018. ^ Lauren Hernandez (18 August 2018). "Firefighters battle hot, dry conditions at Mendocino Complex". WRAL.com. Retrieved 18 August 2018. ^ Hannah Beausang (18 August 2018). "Mendocino Complex fire now at 380,690 acres". The Press Democrat. Retrieved 18 August 2018. ^ Cosgrove, Jaclyn (February 9, 2019). "Report criticizes fire agencies' cooperation during Mendocino Complex blaze". Los Angeles Times. Retrieved 2019-04-02. ^ Randy Rossmann (28 August 2018). "Ranch fire's forward progress stopped". The Press Democrat. Retrieved 28 August 2018. ^ a b "Mendocino Complex Update for September 1, 2018". InciWeb. September 1, 2018. Retrieved September 2, 2018. ^ a b "Mendocino Complex Update for September 4, 2018". InciWeb. September 4, 2018. Retrieved September 13, 2018. ^ "Mendocino Complex Update for September 15, 2018". InciWeb. September 15, 2018. Retrieved September 20, 2018. ^ "New Evacuations Ordered; Wildfire Raging In Mendocino National Forest". KPIX. 2 August 2018. Retrieved 2 August 2018. ^ Freedman, Wayne (2018-08-09). "Animals rescued from wildfires by motorcycle-riding CoverGirl". ABC7 San Francisco. Retrieved 2018-08-10. ^ "ASPCA steps in to rescue piglets, llamas, cats, dogs from Mendocino Complex fire". SFGate. 2018-08-07. Retrieved 2018-08-10. ^ "Mendocino Complex Incident Update – 8/2/2018 Time: 7:30 p.m." (PDF). CAL FIRE. State of California. 2 August 2018. Retrieved 22 September 2018. ^ "Mendocino Complex Evening Update for August 3, 2018". inciweb.nwcg.gov. 3 August 2018. Retrieved 22 September 2018. ^ "Mendocino Complex Evening Update for August 4, 2018". inciweb.nwcg.gov. 4 August 2018. Retrieved 22 September 2018. ^ "Mendocino Complex Evening Update for August 5, 2018". inciweb.nwcg.gov. 5 August 2018. Retrieved 22 September 2018. ^ "Mendocino Complex Evening Update for August 6, 2018". inciweb.nwcg.gov. 6 August 2018. Retrieved 22 September 2018. ^ "Mendocino Complex Evening Update for August 7, 2018". inciweb.nwcg.gov. 7 August 2018. Retrieved 22 September 2018. ^ "Mendocino Complex Evening Update for August 8, 2018". inciweb.nwcg.gov. 8 August 2018. Retrieved 22 September 2018. ^ "Mendocino Complex Evening Update for August 9, 2018". inciweb.nwcg.gov. 9 August 2018. Retrieved 22 September 2018. ^ "Mendocino Complex Evening Update for August 4, 2018". inciweb.nwcg.gov. 10 August 2018. Retrieved 22 September 2018. ^ "Mendocino Complex Evening Update for August 11, 2018". inciweb.nwcg.gov. 11 August 2018. Retrieved 22 September 2018. ^ "Mendocino Complex Evening Update for August 12, 2018". inciweb.nwcg.gov. 12 August 2018. Retrieved 22 September 2018. ^ "Mendocino Complex Evening Update for August 13, 2018". inciweb.nwcg.gov. 13 August 2018. Retrieved 22 September 2018. ^ "Mendocino Complex Evening Update for August 14, 2018". inciweb.nwcg.gov. 14 August 2018. Retrieved 22 September 2018. ^ "Mendocino Complex Evening Update for August 15, 2018". inciweb.nwcg.gov. 15 August 2018. Retrieved 22 September 2018. ^ "Mendocino Complex Evening Update for August 16, 2018". inciweb.nwcg.gov. 16 August 2018. Retrieved 22 September 2018. ^ "Mendocino Complex Evening Update for August 17, 2018". inciweb.nwcg.gov. 17 August 2018. Retrieved 22 September 2018. ^ "Mendocino Complex Evening Update for August 18, 2018". inciweb.nwcg.gov. 18 August 2018. Retrieved 22 September 2018. ^ "Mendocino Complex Evening Update for August 19, 2018". inciweb.nwcg.gov. 19 August 2018. Retrieved 22 September 2018. ^ "Mendocino Complex Evening Update for August 20, 2018". inciweb.nwcg.gov. 20 August 2018. Retrieved 22 September 2018. ^ "Mendocino Complex Evening Update for August 21, 2018". inciweb.nwcg.gov. 21 August 2018. Retrieved 22 September 2018. ^ "Mendocino Complex Evening Update for August 22, 2018". inciweb.nwcg.gov. 22 August 2018. Retrieved 22 September 2018. ^ "Mendocino Complex Evening Update for August 23, 2018". inciweb.nwcg.gov. 23 August 2018. Retrieved 22 September 2018. ^ "Mendocino Complex Evening Update for August 24, 2018". inciweb.nwcg.gov. 24 August 2018. Retrieved 22 September 2018. ^ "Mendocino Complex Evening Update for August 25, 2018". inciweb.nwcg.gov. 25 August 2018. Retrieved 22 September 2018. ^ "Mendocino Complex Evening Update for August 26, 2018". inciweb.nwcg.gov. 26 August 2018. Retrieved 22 September 2018. ^ "Mendocino Complex Evening Update for August 27, 2018". inciweb.nwcg.gov. 27 August 2018. Retrieved 22 September 2018. ^ "Mendocino Complex News Release for August 28, 2018". inciweb.nwcg.gov. 28 August 2018. Retrieved 22 September 2018. ^ "Mendocino Complex Update for August 29, 2018". inciweb.nwcg.gov. 29 August 2018. Retrieved 22 September 2018. ^ "Mendocino Complex Update for August 31, 2018". inciweb.nwcg.gov. 31 August 2018. Retrieved 22 September 2018. ^ "Mendocino Complex Update for September 2, 2018". inciweb.nwcg.gov. 2 September 2018. Retrieved 22 September 2018. ^ "Mendocino Complex Update for September 3, 2018". inciweb.nwcg.gov. 3 September 2018. Retrieved 22 September 2018. ^ "Mendocino Complex Update for September 17, 2018". inciweb.nwcg.gov. 17 September 2018. Retrieved 22 September 2018.